Happy Saints: Free ‘Year of Mercy’ printables with ‘St. Thérèse Prayer Journal’! 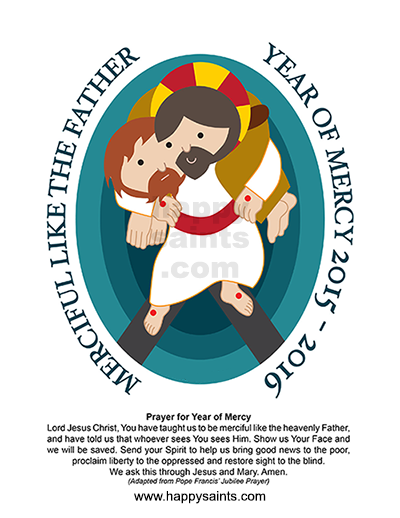 Free ‘Year of Mercy’ printables with ‘St. Thérèse Prayer Journal’! For a limited time, the new ‘Let’s Pray With St. Thérèse’ Prayer Journal now includes a free set of ‘Year of Mercy’ printables! Based on the official Jubilee logo, this Happy Saints special artwork is adapted to be suitable for children and the young-at-heart! The free set includes a printable poster, coloring page, greeting card, prayer cards and badges. Already purchased the St. Thérèse Prayer Journal? No worries, I will be sending you a download link to the bundle version within these few days. If you haven’t gotten the prayer journal, now is the time! It is a great way to begin the Year of Mercy and the liturgical year. A printable illustrated prayer journal featuring the ‘Little Way’ of St. Thérèse of Lisieux, it uses her wisdom to encourage the young and young-at-heart to explore their unique relationship with God. 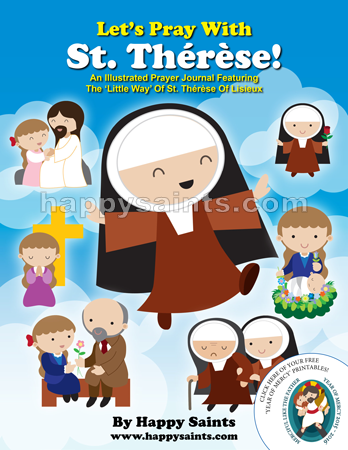 There are 17 chapters, each with a theme based on St. Thérèse sayings and accompanied by reflection passages, prayer cards, question-answer sheets and cute artworks. By entering into the heart and mind of St. Thérèse through her sayings, readers are encouraged to look at ways to respond to God and His Presence, in the concrete situations of their own lives.